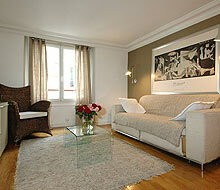 This two bedroom apartment features original French design paired with Japanese and modern influences. 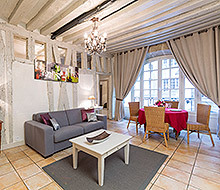 With detailed crown moulding, exposed wooden ceiling beams, and chandeliers, this apartment offers comfort and style. 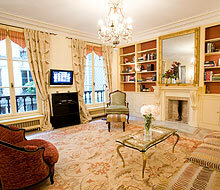 The main salon and library is a slice of 1930’s Paris! With its decorative fireplace, comfortable furnishings, and patterned textiles, the room also features large double windows with embroidered drapes, a grand mirror, and period antiques. The dining room is decorated in a rural French style with barn board walls, two curtained windows, and antique sconces. Connected to the dining area through an interior window and bar, the kitchen offers updated conveniences discretely tucked away behind matching bespoke frontage. Well equipped, the kitchen also features solid marble countertops and brick walls. Down the hallway you enter the Louis XV master bedroom with its beamed ceiling, decorative fireplace, and floor-to-ceiling velvet drapes. The room also has a queen-sized bed, a sitting area, and a flat screen television. The master bathroom has red marble tile floors and walls, a beamed ceiling, elegant mirrored vanity with washbasin in addition to three large mirrors, a towel warmer, full-size soaking tub, and WC. In the second bedroom, Japanese fabric-upholstered walls and Shoji screens serve as doors to expansive closets. 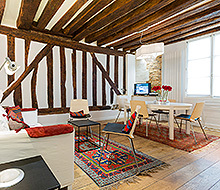 The room features two single beds that can be combined to form a king-sized bed and an en suite bathroom. Also in a Japanese style, the en suite bathroom has wooden and tile accents along with a marble shower, washbasin, well-lit vanity, towel warmer, and WC.